Hello one and all! It's a great pleasure to have author N.R. Walker with us today on the blog. She just had a new book release and is talking about it and other things!!! Lots of fun that's for sure. There's a fabulous giveaway at the end so be sure to enter! Hey, greetings from Australia! 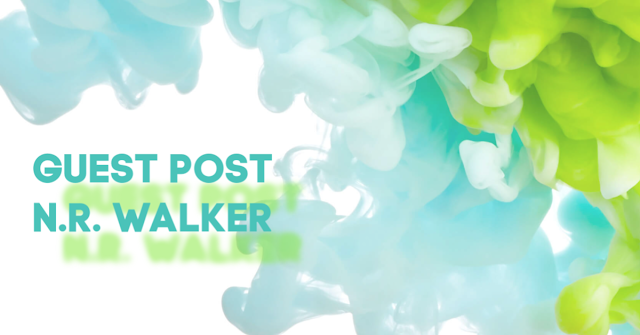 Thanks to Diverse Reader for having me on their blog today! I want to talk about sequels and series, about the writing process, sales, and jumping the shark. My latest release, Cronin’s Key IV – Kennard’s Story, just came out two weeks ago! Like the title suggests, it’s the fourth book in my Cronin’s Key series; a crazy adventure tale of vampires and the spin we’re told throughout history to keep their secret safe. Kennard is a side character throughout the first three books but we hear his side of the story in book four, and I absolutely loved spending time with these characters again. I’m not an author who can write to order. My stories need to come from me, the characters talk in my head and they only divulge their secrets as I write. I don’t plan or plot or outline, so as I’m writing I’m quite often just as surprised as you are when you’re reading it. And I don’t often plan to write more than one book in any given universe. I typically started out writing one book, and by the time I get to the end of that book, the characters are the one to the side of the story is finished. Every one of my books has a beginning middle and an end, but it just comes down to whether the character is satisfied with the happy ever after. When I wrote Red Dirt Heart, and Point of No Return, I had only ever intended to be one book. I got to the end of the first book but their story was far from finished. So I wrote the sequel. And when I got to the end of that book their story still wasn’t finished, so I just kept writing until it was. But with my Thomas Elkin series and my Spencer Cohen series I had an inkling that they would be three books each. Book one was meeting and falling in love, book two was proving to themselves and their friends that they were the real deal, and book three was proving it to the world. That’s a fairly broad summary, and it sounds formulaic, but it kind of fits both storylines. My Cronin’s Key series was quite different. I wrote the first three books, mostly from Alec and Cronin’s point of view, and I just kept writing until they were happy with their happy after. And I’d always wanted to write Kennard’s story, but he wasn’t ready to talk to me. Until late last year when he decided it was time. Like I said, the writing process on sequels and series is different for every author, and I was quite surprised to have a character from three years ago deciding to talk to me. But, talk he did. My biggest concern was getting the voice of existing characters wrong. It’d been years since I’ve written these characters, and I released something like 20 books in between. Which is 40 characters and 20 plot lines, about 100 side characters, different locations, different vernacular. So while it had been some years since I’ve been in touch with these characters, some readers only finished the three books the week before, and some had read the series many, many times. They would know if I got something wrong, or is the character was out of character. That was the scariest part for me. Some people had waited years for this book, and I’d have been devastated if they were disappointed. Keeping a character’s voice isn’t as easy as it sounds. There are thought processes, idiosyncrasies, mannerisms and habits etc, that make a character three-dimensional on the page. And then there’s the dilemma of knowing when to stop. I’ve had some readers tell me “OMG I could read about these characters forever!” But I’d like to think I know when to let characters go. Their story should be organic, and fabricating drama and ridiculous plotlines can ruin an entire series. Kind of like the first Sharknado was like “wheeeeeeeeee this is crazy fun” but then by movie six you’re like FOR THE LOVE OF GAWD MAKE IT END! It’s common knowledge that subsequent books in series don’t sell as well as the first or second book, so drawing out any series can be problematic for a lot of reasons. Your book one in the series might sell (for example) five hundred copies but book four or five may only reach one hundred, and that might not even cover the cost of production. So I had many reservations about writing this book. And when I was writing the first draft, the storyline just keep getting crazier and crazier but I just went with it and trusted the characters knew what they were doing. And as it turned out, they did. Thankfully. It had been sometime since I’d written a sequel. My last ten or so releases were all single stand-alone stories, and my next few upcoming releases are all standalones as well. But I do have an idea for another trilogy later in the year. I was going to write it last year but the characters weren’t ready, though now it feels like their gearing up to talk and so I will begin the process all over again. 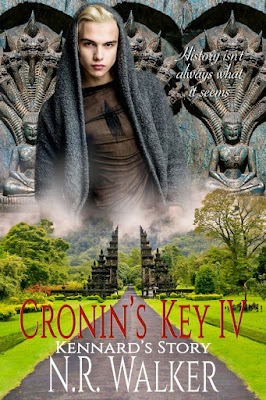 For your chance to win a copy of Cronin’s Key IV - Kennard’s Story simply comment on this post and we’ll pick one lucky winner soon! Thanks for the post, the book sounds great. It's going on my TBR list. Congrats to N.R. Walker on the new release. Thank you N.R. Walker for writing Kennard's story. I feel your pain about the whole "OMG make it end" but when the stories are beautifully written and the characters are relatable, no matter their wacky adventures, readers can never get enough. Maybe we don't want huge full fledged novels but a short story or a holiday one here and there just to see how they are is always welcome ;). Congratulations on your new release! It's a wonderful, complex world with such exciting love stories. I haven't read this series yet but it sounds very interesting. I hadn't thought about how challenging it could be to get the voices of the characters right after time away from them. I'm one of those readers reading Cronins Key now for the first time and can I say, amazing. Typically I don't read PNR but for you I was game. Love how the stories have progressed and weaved together. The characters are wonderful and I'm loving every word. Can't wait to start IV! Thanks for the post! I can't wait to read another book in this world. The cover looks great and I'm looking forward to checking this out. This is a great series ! I still need to read #3. Looking forward to doing that. This is a series I am yet to get to but so many people have said reading and listening to it was amazing. They're all on my wish list and I look forward to diving into this series!